Peyarchi is the movement or transit of a planet from one rasi to the next. Even though all planets transit from one rasi to the next, it is the Sani Peyarchi and Guru Peyarchi, which are considered very important. Sani or Saturn takes about 30 years to revolve around the Earth. This means that Sani will stay in one rasi for 2 and half years before he moves to the next rasi. Seven and half years of Sani (Ezharai sani) means the stay of Sani in the previous rasi, the rasi of the Jathaka and the next rasi, each for 2.5 years. This Ezharai Sani happens to everybody repeating again after the 30 year cycle. 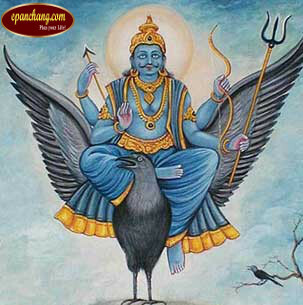 Sani (Saturn), the Lord that brings us all good things transits from Thulam Rasi (Libra) to Vrischikam Rasi (Scorpio) on Tuesday 16th December, 2014 and is going to remain there for the next two and half years. This shift is going to bring in mixed fortunes. It is advised that persons in all Rasis in general perform Poojas to appease Lord Sani. THIRUNALLAR (near Karaikal) is the temple for Saneeswarar and is one among the Nava Graha Stalams. The presiding deity here is Saneeswara Baghawan with goddess Praneswari.